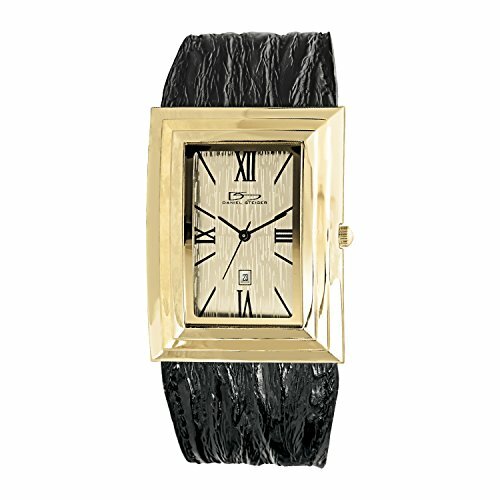 It's hard to find anything more unique than this 1940s classic, black dial Deco revival timepiece. Some unique features of this watch include Deco influenced exterior numerals and markers and an exaggerated raised bubble crystal made of high impact acrylic polymer, just like the original. It's a one-of-a-kind vintage design and nothing compliments the classic black dial more than the beautiful black leather strap. Features a 23K gold plated case and components, Precision quartz movement (Miyota), includes a 3 year battery, a recessed second hand sub-dial and an 18mm genuine leather band. This watch is water resistant and has a 3 year limited warranty. They say Art Deco died out because it was just too beautiful, too decadent to continue for any longer. Our Deco inspired watch features all the classic angular looks that you would have found on any watch of the time from one of the big Parisienne jewelers that American heiresses flocked to in order to spend their millions. The most striking aspect of this fine timepiece is definitely the beautifully executed princess cut Diamondeau dial. These stones have been set in such a way as to show NO metal prongs or hooks, giving the appearance of a sheet of flawless sparkling precious gems. The watch crystal has also been faceted to mirror the look of the dazzling watch dial. A precision quartz movement is housed in a solid stainless steel case that has been expertly fused with 18k yellow gold. Magnificent presentation case sent with each timepiece. Peugeot watches have been redefining fashion since 1957. At its inception, Peugeot was a manufacturer of luxury, handcrafted, gold timepieces. After a successful twenty five year run in the luxury category, rising gold prices and market changes dictated a new direction. Peugeot quietly reinvented itself into a well-designed, high-quality watch line at affordable prices. This strategy led to the formation of a new marketplace which later became known as fashion watches. The ability to translate high fashion trends into a watch line that appeals to customers with an eye on style and price has led to Peugeot's recognition as a proven successful American brand found in better department stores nationwide. The gold-tone bezel with black hours is a wonderful deco-inspired vintage feature. On the white dial are black hands with no markers-a wonderfully clean dial. Above the hands lies the Peugeot logo. This case is on the petite side at 23mm. The white calfskin leather strap is comfortable and easily adjustable. 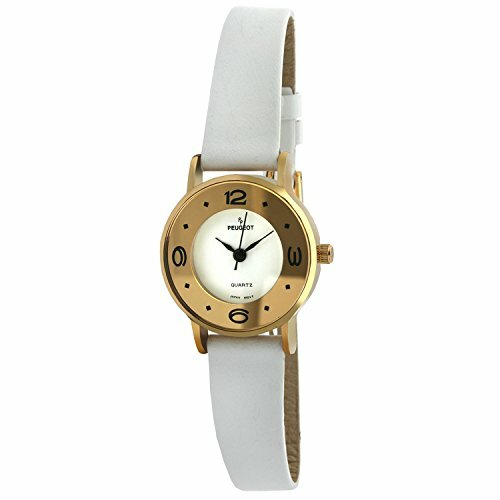 A lovely looking watch for women with classic style! 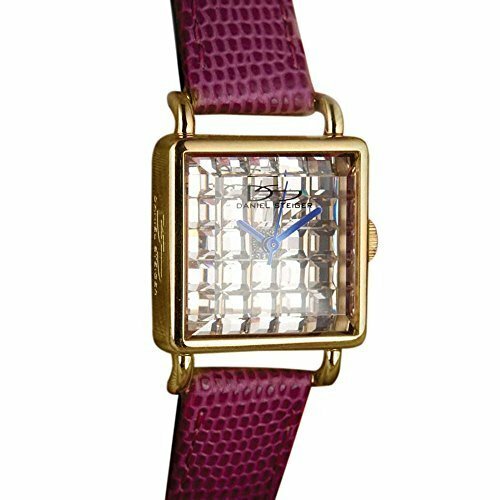 The Deco--a stylish tonneau shaped leather multi-function watch from Gino Franco. The clean, tonneau shaped case features a black dial with luminous, silver-tone hands. The subdials tell second and 24 hour time. Easy to read silver-tone Arabic numerals are at hours 3, 6, 9, and 12. The elegant tonneau case is a large and impacting 44mm. The caseback and watch are built to last, 316L stainless steel. The band is genuine Italian leather. A buckle clasp keeps this watch secured to your wrist and allows you to adjust to your wrist size. 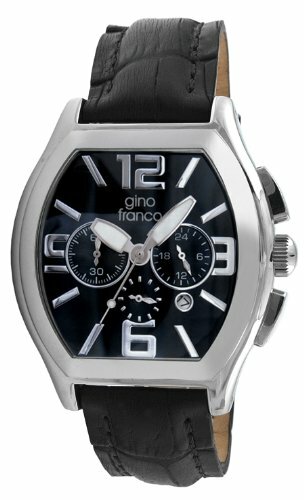 Gino Franco watches are internationally inspired, fusing art and individuality with form and fine attention to detail. Each timepiece comes with a Gino Franco box and a limited lifetime warranty. 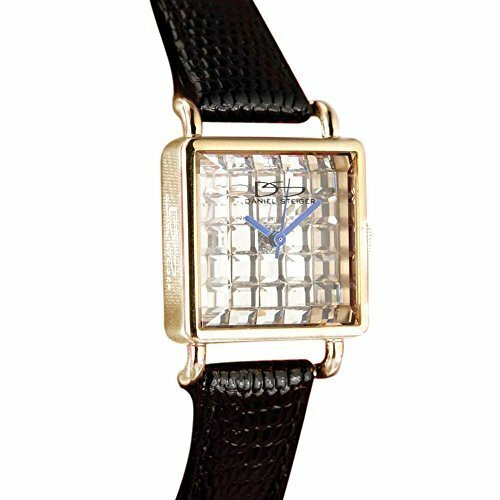 This designer inspired stainless steel square deco fashion watch features a sophisticated rectangular stainless steel face with a row of sparkling crystals outlining the edge. The brown leather band strap is constructed of genuine leather. Perfect for any occasion. 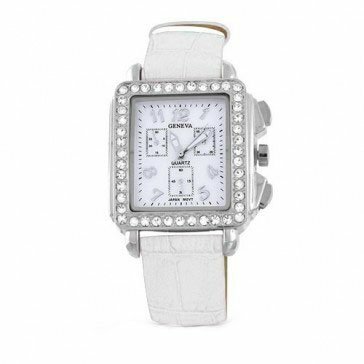 This sophisticated designer inspired watch has a stainless steel face that's accented with dazzling crystals. With a genuine black leather band it will fit an 8.75" wrist with ease. It has an airy, casual feel despite its heavyweight appearance. Because this is a designer inspired piece, it represents the pinnacle of style and grace. This sleek piece of wholesale costume jewelry is certain to act as a great accent to your wardrobe for any special occasion, so buy this crystal jewelry today. Classic style at a bargain price. Looking for more Deco Timepiece Fashion Watch similar ideas? Try to explore these searches: Silver Matting, Ridgid Plumbing Tools, and Lesro 2 Seat Sofa. Look at latest related video about Deco Timepiece Fashion Watch. Shopwizion.com is the smartest way for online shopping: compare prices of leading online shops for best deals around the web. 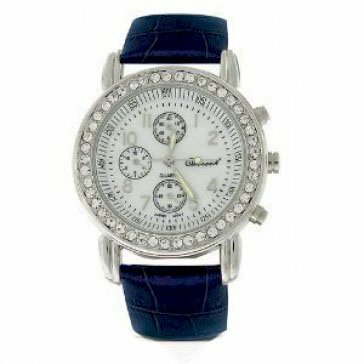 Don't miss TOP Deco Timepiece Fashion Watch deals, updated daily.